We will not think much about months of planning that goes into place. And when you are the one planning the event, your research leads to hear lots of rumors and things people assume to be true. You want your event to be remembered with good food and great time. In this post we will explore some of misconceptions going around in catering service world. Most widely known misconception is that buffet is less expensive than sit down dinner. When you are planning a sit down dinner event, you and your caterer have the control on meal portion and how many of each portion they will need. You can also decide on what to serve. And with buffet you require more food, more staff, more variety and more equipment to make it successful as you don’t know how many seconds or thirds or fourths your guests will have. With buffet, it’s not how much they eat, it is how much they put on their plate. Last person to be served must perceive the food as abundant as the first. This way your costs are going to be high. Well when it comes to venues, photographers, you may get discounts as they are trying to fill their empty schedules, but for catering services, off season doesn’t have much effect. 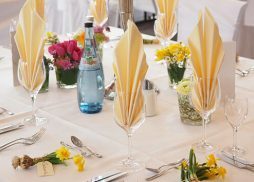 Whether you have your wedding in spring or winter the costs cover will be same for your caterer. The costs of food, labor and equipment or linens are really not affected by the seasons and every wedding will need the same materials to deliver the same level of service. You should not expect to see any considerable savings when booking your caterer. When you are trying to lower the expenses you may think of cutting down on staff from catering team. Many people think it is a good way to save money, but it really isn’t. Catering staff as added by your caterer are specific for the each catering package. If you are having a plated dinner, the required staff is helpful they deliver meals, clean the empty plates away, and make sure the glasses are full. Fewer staff means longer wait time for your guests and guests may feel awkward waiting.